CSS hover effects gives us the ability to animate changes to a CSS property value. In the following lesson we are going to follow that up with different kinds of effects specifically built for use with images. However, these effects can make your site feel much more dynamic and alive. The effects we will be using today all use code that is supported by modern browsers. The following code shows how to show a hover effect on Box Shadow. The following CSS code shows how to present an Image hover effects. Move your mouse over the Image. Opacity is the opposite of transparency, allowing no light to pass through. 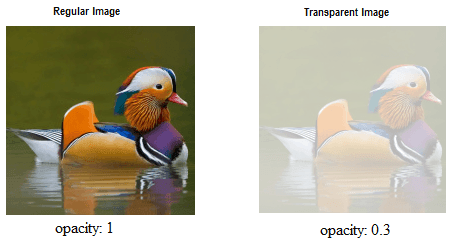 You can create transparent images in CSS with the opacity property . The following CSS program shows how to impliment Opacity on an Image while mouse hover. When you mouse over the image, you can see the image is fading. The tiger is the largest cat species, reaching a total body length of up to 3.3 m and weighing up to 306 kg. Its most recognizable feature is a pattern of dark vertical stripes on reddish-orange fur with a lighter underside. The following CSS code shows how to change an Image on mouse over. On mouse hover one div containging image is placed over the other image. The following source code shows how to change the image link while on mouse hover. Move your mouse over the Image Link. You can change the background color of a Div on Hover. The following CSS code shows how to change div background color on hover. Move your mouse over the Div.